Well-known as a coach, horseman and farrier, Steve McAllister’s experience is solid from the ground up. 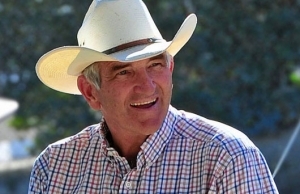 Horses have been a part of his life since working on his parents’ quarter horse farm in Connecticut. Working as a farrier on a number of show jumpers, he grew more and more fascinated with the discipline. As a result Steve built a successful East Coast sales barn, Highborn Horse Park. In 1993 when Jenni Martin relocated to his facility, he immediately recognized her natural talent, skill and drive. They quickly developed a mutually beneficial working relationship and the highly successful association between the two has never faded. Moving to Los Angeles in the fall of 2002, Steve and Jenni are continuing their quest to bring horses to their fullest potential in the show-jumping arena. After determining how to best utilize their combined skills and expertise, they decided to take a select group of horses and riders into their custom-fit program concept, Martin-McAllister Training. With Steve’s extensive farrier knowledge and excellent coaching technique, the program integrates all the proper angles – from horse’s hooves to hunt-seat. Based on the German Training System, the method promotes rhythm, looseness and connection along with acceptance of the bit, impulsion, straightness and collection. Because each horse is unique, Steve and Jenni developed different exercises to suit the various horse and rider’s goals. They found that by doing various exercises, muscle development increases, which leads to a happy horse. Steve is also available for clinics and freelance coaching at specific horse shows.